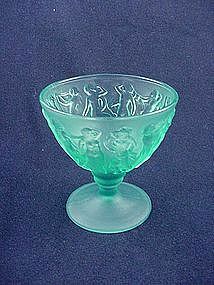 Dancing Nymph is the correct name for this Consolidated pattern - it's sometimes called "Dance of the Nudes" due to listings in depression glass books under that name. Originally produced in 1928, it's a wonderful pattern for the deco collector as well as glass lovers. This is the footed sherbet in the green satin finish. (The color is actually more teal blue than green.) This color is very hard to find because it was only made in 1938-9. Excellent condition, I have 4 available. Price is per sherbet. I have other items in this pattern and color available - see my other listings or email for details.